As Elijah flees from Jezebel, he enters a landscape where God was a familiar presence. God’s preferred hangouts were mountains and deserts. So Elijah flees to the desert again. This time instead of ravens it’s an angel of the Lord who brings him food and drink. But this was not enough for Elijah; he needed something more to set him right after the momentous showdown with the prophets of Baal. So he goes further into desolate spaces; he travels forty days and forty nights and reaches Mount Horeb. What happens next is best quoted directly from the First Book of Kings 19:8-18. He got up, and ate and drank; then he went in the strength of that food forty days and forty nights to Horeb the mount of God. At that place he came to a cave, and spent the night there. Mount Horeb was the mountain on which Moses received the laws from God. 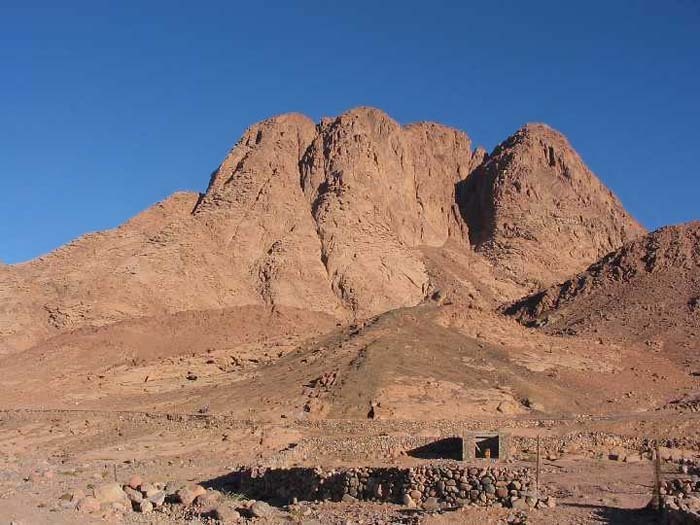 Some parts of the Hebrew scriptures call it Mount Sinai; elsewhere it’s called Mount Horeb. Some scholars think it was in what today is called Sinai Peninsula; others think it was across the Gulf of Aqaba in what today is the Arabian Peninsula – its exact location is uncertain. So Elijah flees to the mountain where God had appeared to Moses. Was he hoping that God would appear to him also? He was not disappointed. God speaks to him, “What are you doing here, Elijah?” I love it when God asks questions like this, as when he asked Adam in the Garden, “Where are you?” (Genesis 3:9) And just as Adam immediately began making excuses and casting blame elsewhere (in his case, Eve), so here Elijah does what most men of God seem to do: he starts complaining. Look at what I’ve done for you, God, while everyone else has forsaken you and broken the covenant. I’m the only one left, and they’re trying to kill me! God was not in the wind; God was not in the earthquake; not in the fire. But God was in the sound of a whisper, in the silence. And again, God asks Elijah, “What are you doing here?” God prefers the quiet presence rather than the loud, spectacular fireworks. Moses wanted to experience the full show, but he got only the tail-end. Perhaps Elijah hoped for the same thing; he got only the whisper. Many Christians look for miracles; many look for clear proofs that God exists. But God is not in the business of proving himself or catering to human vanity – even when the human is someone as important to God as Moses or Elijah! No, God is subtle; God prefers the quiet way, the long-enduring way. Elijah is too full of himself; he is still not satisfied. 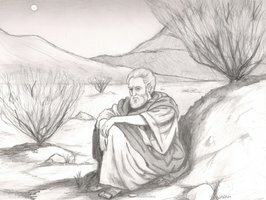 God asks him again, “What are you doing here?” Elijah repeats his lament how he is the only one left who is faithful to God. But God corrects him. No Elijah, you’re not the only one, there are seven thousand others! Here are your instructions…. Let’s jump about 900 years to the future, when Jesus took three of his disciples up to a mountain in Judea. There he was transfigured and there appeared with him Moses and Elijah! The two men who wished to see God’s glory, God’s presence, finally got their wish, 900 years later in Elijah’s case, 1300 years later in Moses’ case! God does not act on our schedule. But Moses and Elijah finally did get their wish; they got to see the glory of God on earth. Because the glory of God was present in the face and body of Jesus Christ. The feast of Transfiguration is coming on August 6th, and it is one of the most glorious and most beautiful celebrations of the Orthodox Church. Elijah’s question is innocent enough. But Elisha’s answer is anything but typical. A double share of Elijah’s spirit? That would be a very arrogant request if it came from anyone other than the man appointed by God to be Elijah’s disciple and successor. But prophets can speak like this, because they know their lives are not their own and it is God who is at work in everything they do. The “spirit” is the ruah of God, the breath of God that animates and inspires everything the prophets do and say. “You have asked a hard thing; yet, if you see me as I am being taken from you, it will be granted you; if not, it will not.” As they continued walking and talking, a chariot of fire and horses of fire separated the two of them, and Elijah ascended in a whirlwind into heaven. Elisha kept watching and crying out, “Father, father! The chariots of Israel and its horsemen!” But when he could no longer see him, he grasped his own clothes and tore them in two pieces. Elisha sees Elijah ascend to heaven in a fiery chariot. And so it happens. 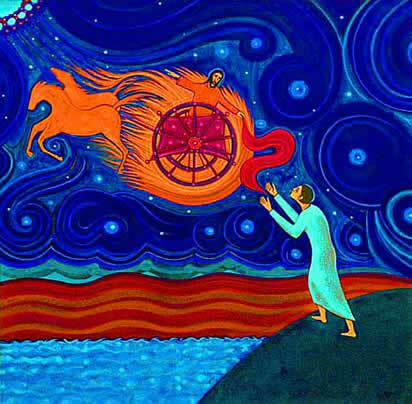 Elisha sees Elijah’s ascent in a fiery chariot. The deed is done; Elisha will receive the double portion and will succeed Elijah as “troubler of Israel.” If Elisha had a double portion of Elijah’s spirit, Jesus, of course, had the fulness of the Spirit resting on him. Jesus, too, was a “troubler of Israel.” But he is also the “troubler” of every nation that puts its trust in idols and false prophets; he is troubler of every power and principality that aims to dominate the human spirit. Categories: Uncategorized | Tags: Book of Kings, Elijah, Mount Horeb, Transfiguration | Permalink.